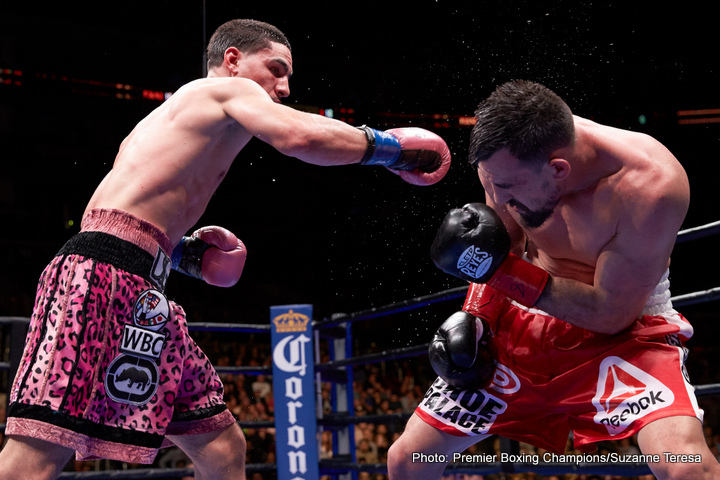 Danny Garcia (32-0, 18 KOs) did what many boxing fans expected him to do by opting to use a lot of clinching and moving to defeat Robert “The Ghost” Guerrero (33-4-1, 18 KOs) in their fight last night for the vacant WBC welterweight title. Guerrero’s trainer Ruben Guerrero feels that Garcia did little more than run and hold all night long rather than fighting. Further, Ruben didn’t like how the referee was constantly breaking the action when Guerrero was trying to fight on the inside against Garcia. Garcia previously did a lot of clinching and moving in his fight against Lucas Matthysse in 2013 to grind out a 12 round decision win. That’s why it wasn’t surprising to see Garcia go back to the same plan to use it for Guerrero, because there was no way that Garcia was going to be able to win the fight by brawling. Garcia didn’t have the size or the inside fighting skills to beat a fighter like Guerrero in a toe-to-toe brawl. “He [Garcia] kept running away, holding, running, holding,” Ruben said to Fighthub. “I don’t know how in the heck they gave him the fight. I think if they let him [Guerrero] fight a little more in those rounds, Robert would have stopped him. He was hurting him in the body. They got the break. They pulled Robert away, and he didn’t get the fight we wanted on the inside, but we did enough to win the fight. He never hurt Robert. He hit Robert with everything he had, but he never hurt Robert. Like Robert said, he never hurt me. He [Garcia] was pretty best up too. I wanted him to fight more on the inside, but every time we fought on the inside, the referee kept breaking it up. I’m happy the way he fought. He fought great. Like I said, we did enough to win. You know what. All we want is a rematch,” Ruben said. I think Garcia really spoiled what could have been a good fight if he didn’t do so much running and holding. He must feel that was the only way he could win the fight, because he wasn’t willing to stand in the pocket and trade with Guerrero. The referee should have taken points away Garcia at some point in the fight to get control over matters because Garcia was holding each time Guerrero got anywhere near him. When you have a fighter that holds on a frequent basis, you need the referee to do their job so that the fans get their money’s worth and the fighter has a chance to win. Next boxing news: Left-Hook Lounge Mailbag: Danny “Swift” Garcia, The Future of Mayweather & Pacquiao, and Porter/Thurman!